On November 26, 2016, ExoMars used its Color and Stereo Surface Imaging System to take this color composite of Mars' moon Phobos. The image consists of two images from each of the camera's four color filters — panchromatic, blue–green, red and infrared — resulting in the high-resolution composite. The European Space Agency's Trace Gas Orbiter orbiting Mars has snapped its first views of Phobos, the largest of two moons circling the Red Planet. The Trace Gas Orbiter, or TGO, is part of the European ExoMars exploration program and arrived in orbit around Mars on Oct. 19. 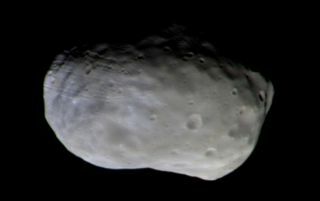 The orbiter snapped the new views of Phobos during its second orbit Mars. It was the second half of a series of test science measurements, with the first half focused on Mars itself during its first orbit. By using images the blue-green and red filters, a 3D image was produced as well. ExoMars orbiter's Color and Stereo Surface Imaging System composed this 3D image of Mars' moon Phobos from from the stereo pair of images collected with two of its four color filters. "Although higher-resolution images of Phobos have been returned by other missions, such as ESA's Mars Express and NASA's Mars Reconnaissance Orbiter, this provided a good test of what can be done with our data in a very short time," Nick Thomas, principal investigator of TGO's CaSSIS camera team at the University of Bern, said in a statement. "The images have given us a lot of useful information about the color calibration of the camera and its internal timing." With testing of the ExoMars instruments underway, team members focus on getting the craft into it's near-circular science orbit by the end of 2017 through aerobraking. The leading scientific goal for TGO's mission is to gather detailed records of rare gases in Mars' atmosphere — methane, water vapor, nitrogen dioxide and acetylene, which compose less than 1 percent of the atmosphere's volume. Methane is of particular interest because Earth's methane is primarily produced thanks to biological activity, with some contributed by hydrothermal reactions. ExoMars also hopes to uncover whether water or ice exists just below the surface. Color and stereo images of the surface will aid in these findings. TGO will serve as a data relay for current and future crafts on the surface of Mars, including the 2020 ExoMars mission featuring a rover and surface science platform. Follow us @Spacedotcom, Facebook or Google+. Original article on Space.com.